This interesting purse-shaped box was painted by well-known Palekh artist Kryukova Valentina. The work is called "A wide Pan-cake week" and the artist has chosen to depict one of the ancient Russian feasts, which is called "Maslenitsa" or "Pancake-week". This feast is arranged to send off the cold winter and welcome the beginning of warm spring. It usually takes place the week before the Lenten fast. 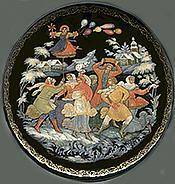 In ancient times Maslenitsa included different magic and religious rites that afterwards transformed into traditional folk customs, such as burning of a woman of straw that embodies the winter, baking of sacrificial bread - pancakes, dressing masquerades, various games, driving in a sledge at high speed and many others. Celebration is in full swing as people are having a good time inside and out of doors. Valentina has perfectly combined various shades of red and yellow tempera paints with lustrous gold metal paint to create a stunning atmosphere of a sunny spring day! The scene is extremely dynamic! The faces of the people in the painting are detailed and expressive! The box is constructed from paper-mache. Black lacquer is used to paint the exterior of the piece while red lacquer completes the interior of the box. The exterior is decorated with intricate gold patterns. The lid isn't hinged and rests flat. The work is signed with the artist's name, Palekh on the bottom of the composition using gold paint.